Occasional Toronto: What a View! 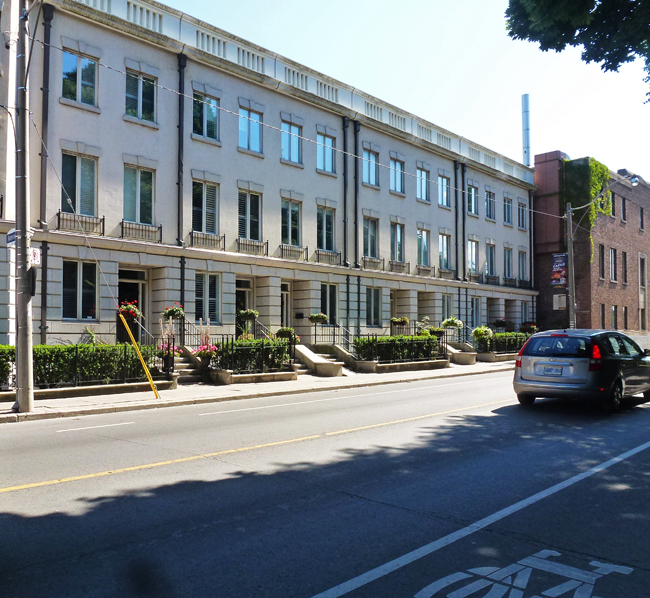 These freehold townhouses are located right across the road from the hill leading up to Casa Loma. In winter they have a great view of the Casa through the tree branches and in summer their view is of the mini forest covering the hill. They were built on what had been dairy property for years and attempts were made to construct high rises here but the residents of the Annex neighbourhood lobbied against that on the grounds that their view of the Casa would be gone. These buildings look great. South of Bloor St., on Yong St., the condo construction is going crazy. That would be a perfect view for people living here. I can understand not wanting to lose it. Definitely something well worth holding onto. Neat condos! Glad they fought for their view! Good for the Annex neighbourhood! Good to hear neighbours were listened to. These look elegant houses, a good addition to any neighbourhood. ...good for them to lobby! Those are lovely looking townhouses and offer a view worth fighting for. Glad they were listened to. This looks like a lovely spot! At least they did not build the high rise buildings that were planned. They look like solid apartment buildings. Hello, they are pretty townhomes. I am glad they fought the highrises.